Reservations need to be made by 2/20/2017 to receive discount. Morphy Auctions’ March 2017 Premier Automobilia and Petroliana Sales Event Hits the Road with An Astonishing Selection of Signage, Globes, Cans, and Other Category Collectibles. This highly anticipated auction features over 125 lots of merchandise from the Gilmore Oil Company, the west coast petroleum distributor known for its dramatic promotions. Las Vegas, NV, February 7, 2017 – Morphy Auctions, the finest auction destination for fresh to the market collections, is excited to announce this 650+ lot sale to be held on Saturday, March 25th, 2017 starting at noon. All items from this event are on display in Morphy’s Las Vegas auction gallery and are available for preview now. 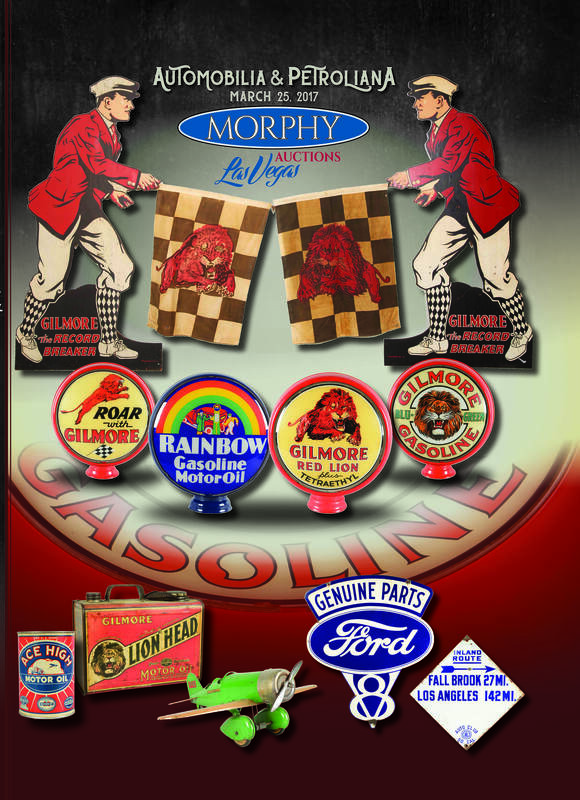 It’s all in the service with this sale’s collection of vintage advertising signage from Gilmore gasoline stations. A pair of highlights in this category are worthy of a salute. The first, lot #161, is a Gilmore Gasoline service station flagman with near-perfect paint on each side. The second, lot #162, is another Gilmore service station flagman with very nicely aged paint. Both come with an original Gilmore flag and are considered the “holy grail” of Gilmore advertising. These signs were placed at the top of stations to grab attention and were very effective in doing so! They are estimated at $15,000-20,000 and $10,000-15,000 respectively. Lot #163, a Gilmore Blu-Green masonite sign is estimated at $5,000-7,500. This rarity, with exceptional color and gloss, was made by Vitachrome in Los Angeles and is marked “Property of The Gilmore Oil Company” in the corner. And lot #165, a possibly one of a kind, single sided hand painted tin Gilmore highway sign in a wooden frame is certain to go into overdrive with its $5,000-7,500 estimate. This sale offers an expansive selection of car and transportation themed signage from other companies and organizations as well. It’s easy to get lit up over lot #191, four large GULF porcelain neon letters in working condition; they are estimated at $4,000-6,000. Lot #281, a Ford V8 Genuine Parts triangle double sided porcelain sign, is right on point with its $5,000-7,500 estimate. And lot #350, a blue and white Southern California Auto Club diamond road sign is estimated at $1,000-1,500. This hidden jewel is truly a great piece of early Los Angeles history. There is no place on Earth with a finer selection of globes than this sales event. It’s nonstop excitement with lot #242, a set of Signal globe lenses in a new metal globe body. These feature the company’s traffic light logo and are estimated at $4,000-6,000. Another strong contender in this category is lot #56, a set of Richfield “The Gasoline of Power” lenses. This seldom seen globe with nice colors is estimated at $2,500-5,000. Lot #235, a Mobiloil milk glass oil cabinet globe with the company’s early gargoyle logo is estimated at $2,000-3,000. This example is in very good condition and features a copper screw base. Lot #238, a pair of Hudson Ethyl globe lenses decorated with the company’s truck logo, is estimated at $1,500-2,500. And the heat is on with lot #240, Sunray Gasoline Globe Lenses in an original orange Capco globe body, estimated at $1,500-2,500. It’s time to focus on this sale’s offerings of single globe lenses, with several fine Gilmore lion themed examples on offer. Lot #51, a Gilmore Red Lion Plus Tetraethyl example – one of the most desired Gilmore lenses known – is king of the category with its $15,000-20,000 estimate. Another mane attraction in this group is lot #52, a Gilmore Blu-Green lens featuring roaring lion head. It is estimated at $10,000-15,000. Collectors will pounce on lot #53, a Roar with Gilmore lens decorated with a leaping lion and checkered race flag, estimated at $8,000-12,000. And lot #50, a Rainbow Gasoline Motor Oil Lens in a new body, is certain to generate a spectrum of interest. It is estimated at $15,000-30,000. It’s can-do with this sale’s comprehensive offerings of unusual containers, with vintage oil, gas, antifreeze, cleaner, polish, and lighter fluid packaging on offer. Things are certain to soar with lot #1, an ACE HIGH motor oil quart can with great airplane graphics. It is estimated at $1,500-3,000. Lot #3, a Bisonoil motor oil quart can illustrated with a proud buffalo, is estimated at $600-900. Lot #7, a Gilmore wax paste cleaner can featuring the Gilmore truck, is the wheel-deal with its $750-1,500 estimate. And one final headliner of note here is lot #10, a Gilmore one gallon can decorated with the face of the company’s roaring lion. This rare can with nice age and patina is estimated at $750-1,250. This transportation-themed sale crosses the finish line with a great selection of pumps, displays, ephemera, and pressed steel toys and models, including lot #420, a Buddy L Mack tanker truck estimated at $750-1,500 and lot #423, a Keystone monocoupe airplane, estimated at $500-750.